An indulgent all-in-one risotto Shrimp Bowl, ready in under six minutes. Bring out the wine glasses and table settings. When you’ve got a bowl full of perfectly cooked Shrimp and mushroom risotto in a black garlic & wine sauce, you deserve a fancy night in. 1. REMOVE bowl from box. CUT 1-inch slit in film to vent. 5. *MUST BE COOKED TO AN INTERNAL TEMPERATURE OF 165° IN SEVERAL SPOTS. 2. Remove bowl from box. CUT 1-inch slit in film to vent. 3. Place bowl on baking pan. Bake for 60 to 65 minutes*. Remove film and STIR halfway through cooking. *MUST BE COOKED TO AN INTERNAL TEMPERATURE OF 165° IN SEVERAL SPOTS. Cooked arborio rice, Shrimp (Shrimp, salt, sodium di-, tri-, and polyphosphate [to retain moisture], sodium bisulfite and sodium citrate [preservatives]), water, mushrooms (mushrooms, water, salt), olive oil, cream, Parmesan cheese (pasteurized cow’s milk, cheese culture, salt, enzymes, black garlic and wine seasoning (maltodextrin, dehydrated garlic, vinegar solids, modified corn starch, spices, malic acid, dehydrated parsley, black garlic powder, soy lecithin, lactic acid, jalapeño pepper, white wine solids, natural flavors), onions, corn starch, garlic (garlic, water), butter, white wine (contains sulfites), sea salt, parsley, tara gum. 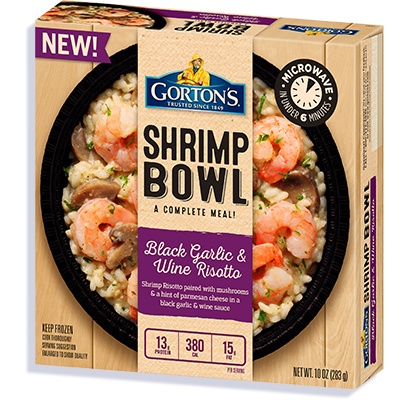 Learn more about limited-release Gorton's items. We want to know what you thought!